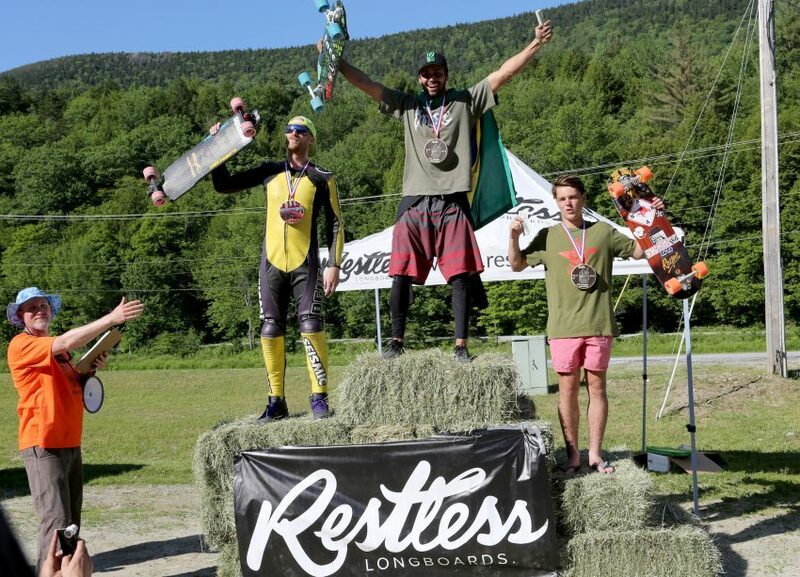 Carlos Paixão (BRA) cemented his reputation as the dominant downhill skater in the world today, with an impressive win at the Downhill Throwdown at Killington. After qualifying second fastest he won every one of his heats, smashing out a 1:49.0 track record and showing some impressive racing tactics. 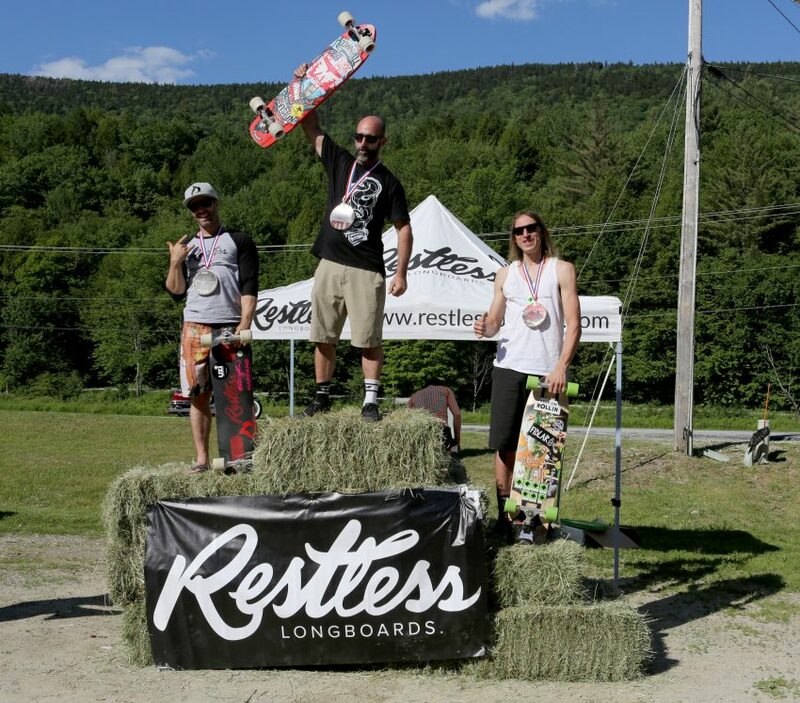 His Brazilian rival, Thiago Lessa, risked everything on a pass in the final corner, but slid out, allowing the consistently fast Coloradon Aaron Hampshire to swoop into second, and Mitch Thompson of Australia into third. 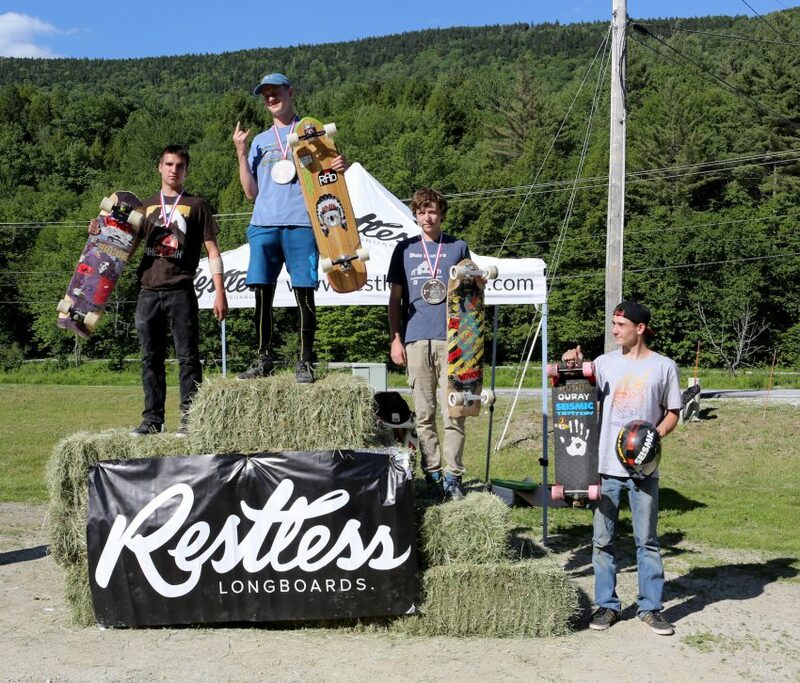 Full results for all categories are here. Carlos beats Aaron and Josh in the semis. Pic: Marion Ross. The Womens race was all about Emily Pross. 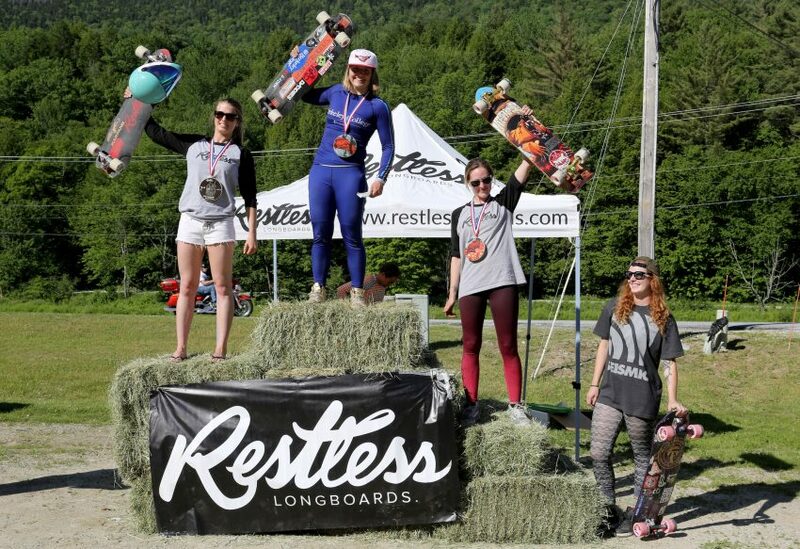 The high-speed Killington track is tailor-made for her, and today she posted the fifth fastest time of all skateboarders, men and women. Emily came seventh in Opens after a spectacular crash immediately after overtaking Zak Maytum in the semi-finals. Ed Keifer was hot favorite to win Juniors, but Knox Heslop of Utah was faster all weekend and won convincingly. 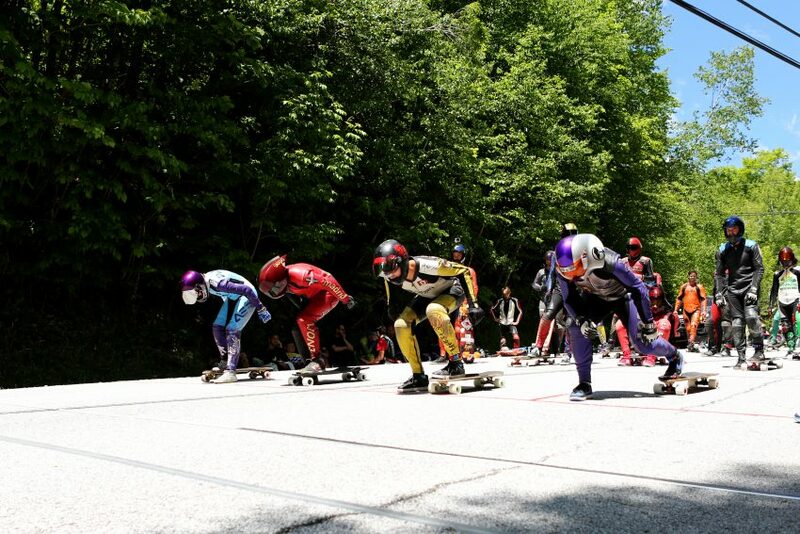 In Luge, Abdil Mahdzan won after Mikel Echegaray Diez and Jan Tarradas Miquel withdrew from the race midway during qualifying day. 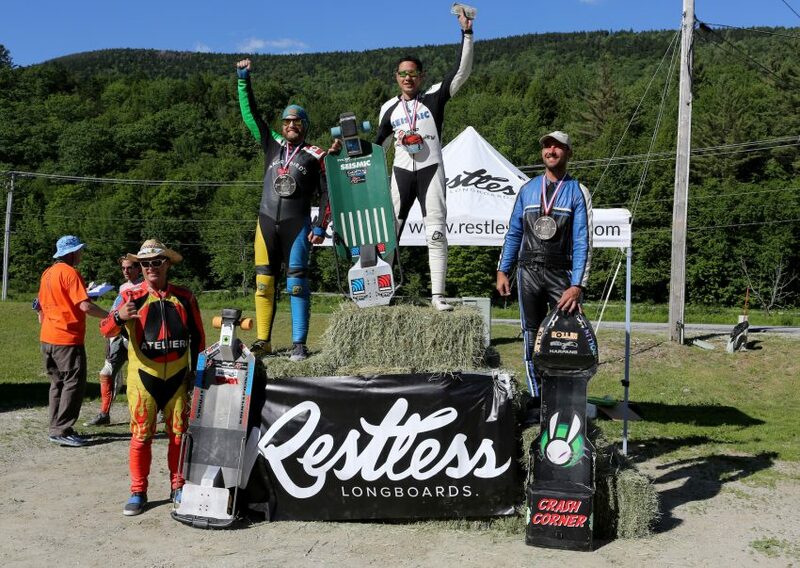 Scott Lembach (USA) beat back the years to win Masters over his much younger rival Nico Desmarais, with Rookie Pascal Jean rounding it out in third. 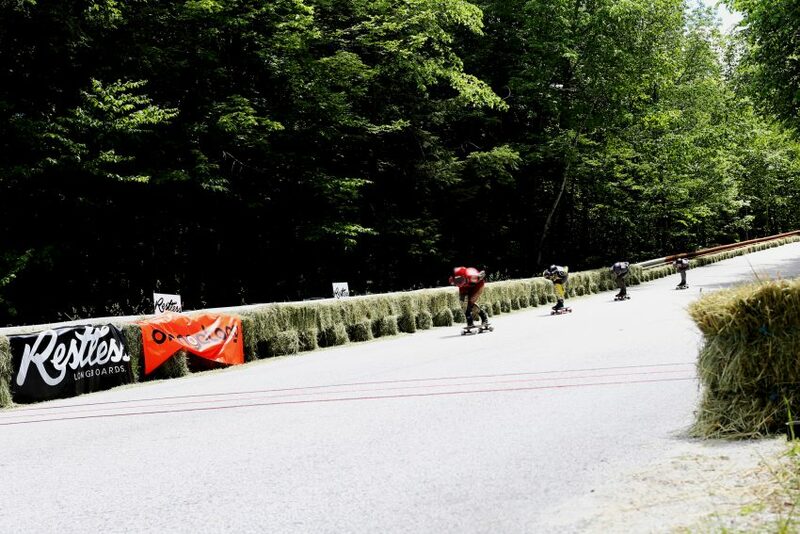 Skaters reached 70 mph today during race heats, making this Killington track one of the fastest and wildest on the tour. Next weekend the tour moves to the legendary Maryhill Loops Rd for the Showdown at the Loops, where the focus is on maintaining a tight race line while riding close.